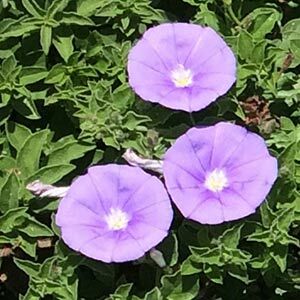 With bright colourful flowers, and many varieties from sky blue to purple,Convolvulus sabatius can be used as a groundcover or a scrambling climbing plant. An excellent dense ground cover plant that grows well in full sun Convolvulus sabatius (pictured right) is low growing with masses of flowers in summer. Commonly called Moroccan Glory Vine, and Blue Bindweed, it is related to sweet potatoes as well as moon flowers. Unlike some ground cover plants this is fast growing drought tolerant and also copes well with frosts. A natural trailing habit, as well as good dense growth make it useful in a range of landscaping situations. Originally Southern Europe and Northern Africa this is a great plant for Mediterranean style gardens as well as for growing in containers. Flowers are an attractive mauve colour, foliage is a good mid green. 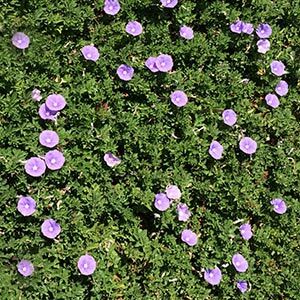 This is ground cover plant that can be used to fill a hard to manage space, or used as a features when allowed to trail over rock walls. Also used in hanging baskets where its trailing habit creates an attractive effect. Propagation is easy by division of established clumps. Best carried out in spring. You can also grow Morning Glories from seed, follow these 5 simple steps. Seed is best sown in early spring. Nick the seed with sandpaper or a nail file to speed up germination. Soak the seed for 12 hours in warm water. Once good growth is achieved plant out into the garden. Drought tolerant and coping well in poor soils Convolvulus sabatius actually requires little care at all. You can prune back to maintain the spread and shape. Ensure a well drained position and fertilise with a general purpose slow release fertiliser in spring. A little extra water in summer in dry periods as needed, but do not over water.